are they showing a new body type??? Not sure 'new body type' really counts when it comes to the new line considering they're all kits now. Basically, yes. All Shinkis are going to be following the Megami Device body standard, and either Sitara (Alice Gear Aeigs) or Blade's Shinki is going to be the debut of the MD-Small body type, which should be analogous to the MMS-3rd Small. While individual kits have slightly different core body construction (for color separation purposes), all MDs so far have followed a joint and peg standard to allow partsswapping. 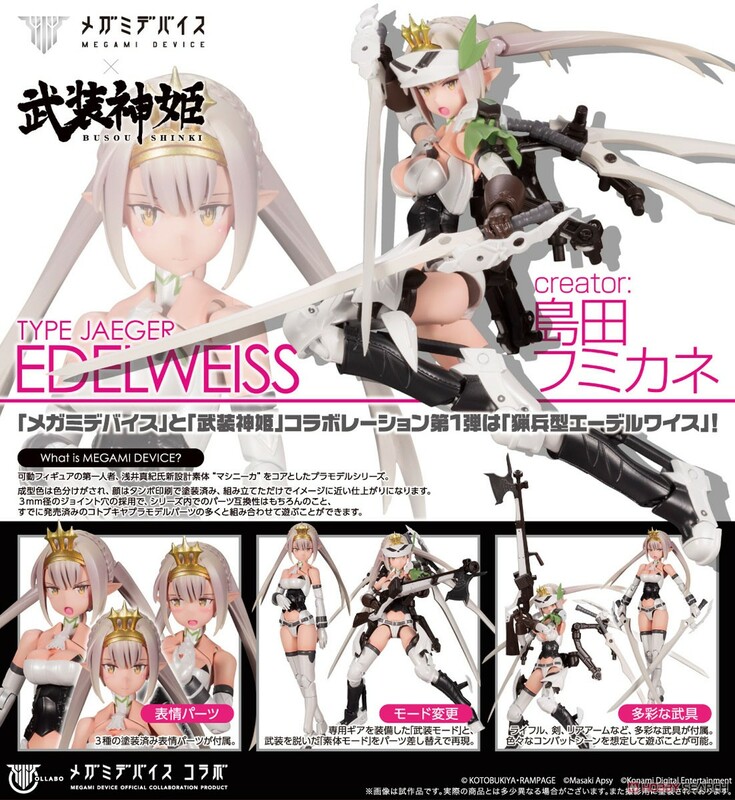 B-Series (Shinki) Megami Device Type-JAEGER Edelweiss! She's got elf ears and a princess crown, an assault rifle, 4 swords, and a generous cup size with cleavage. ok now that she's out in the wild... anyone here (pre)ordered her? Once I get my own Edelweiss kit I'll build her and post pics on Show n' Tell. I didnt. I was waiting on reviews. And not to keen on kits to begin with. Just dont have the time.